Stagecoach claims its new £1 intercity bus service Megabus, which launched nationwide on Monday, will transform the industry. We coughed up some loose change to join the first trip from London to Birmingham. I'm not sure what frills a "no frills" coach service can have done away with. From my memory there aren't too many luxuries to start with. But as I approach Victoria's Greenline coach station in the frosty early morning, I put warmth at the top of my list of requirements. 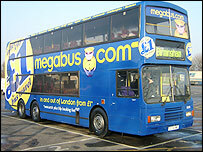 Megabus is a ticketless web-based service, so all passengers have is a booking reference acquired after paying £1 plus a 50p booking fee. The service, which piloted in several cities last year, has already sparked a price war with National Express, and Easyjet founder Stelios Haji-Ioannou is also preparing to enter the market. At 0700 GMT, 30 minutes before departure, there's no bus, no passengers and no indication that this was the right place. A more pressing need is to find a toilet because there aren't any on board, so I pop into a cafe. When I return, a blue double-decker with the Megabus logo pulls up opposite and the driver directs me to Bay 5. There's only one other passenger waiting, and by the time of departure there are just five of us in total. The moment of transformation for the coach industry is going to be a low-key one. "This seems too good to be true," says fellow passenger, Chantal Kashma, commenting on the price. "I haven't seen inside yet to check if it's comfortable, but I usually get the National Express, so it'll be interesting to compare." Chantal goes to Birmingham once a fortnight to see a friend, so I knew her opinion would be an informed one. She says she pays less than £10 for National Express if booking online, although it's £23 otherwise. When the bus pulls up, two supervisors got out to greet us warmly and promise the lack of Megabus signs in the station is going to be addressed. Chantal Kashma: "I'll be back"
Chantal has the honour of being the first passenger to board and her prize is a choice of seats - a dubious reward when there are only five passengers. Inside it resembles any town or city bus in layout, but is refurbished with new upholstery, air conditioning, heating and lighting. Tall people may struggle for leg-room and there are no luggage racks or baggage holds. But the helpful spare driver, Franklin Tumfo, says there's flexibility about the one-item luggage rule and they would always try to find space - much to Chantal's relief. We depart on time with just the five passengers - a total of £7.50 paid between us. Two of them are from exactly the market Stagecoach hopes will flock to Megabus - students. Mingjie Zhou, 24, who studies at the London School of Commerce, says: "It's very cheap and it seems good value, although we didn't expect this kind of bus. But it's fine and we'll definitely use it again because we're students and we like to visit places." As we sit in traffic on the A4, the bus provokes a lot of interest from other motorists, as well as suspicious looks from a National Express driver. There are no pick-ups in London, just one brief toilet break at services in Heston, near Heathrow. 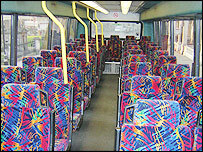 Sitting on the top deck is quite a bumpy ride, especially when trying to eat, but three hours pass quite comfortably. The traffic in London mean we are running 40 minutes late, but no doubt the frilliest coach services share that problem. 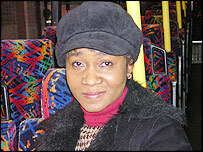 As we edged towards Birmingham city centre, I ask Chantal for her verdict. "Overall, I'm happy," says the 35-year-old Londoner. "It's not as comfortable as National Express but I'd definitely use it again - if I can bring less luggage." Three hours 40 minutes after leaving Victoria, the bus drops us off round the corner from Birmingham Snow Hill station, as if we are uninvited guests. But our arrival does not go unnoticed - a passer-by shows a keen interest and snaps a few pictures as we disembark.